136 pages | 5 B/W Illus. The Intertext series has been specifically designed to meet the needs of contemporary English Language Studies. Working with Texts: A Core Introduction to Language Analysis (second edition 2001) is the foundation text, which is complemented by a range of 'satellite' titles. These provide students with hands-on practical experience of textual analysis through special topics, and can be used individually or in conjunction with Working with Texts. 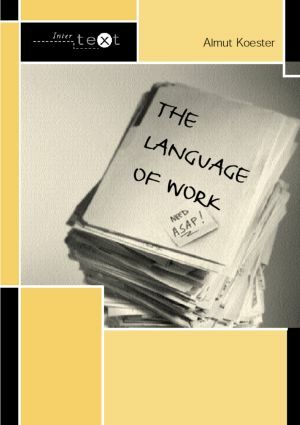 features a useful section on entering the world of work, exploring job adverts and texts that give advice on CV writing and developing 'transferable skills'. The series consists of a foundation text, Working With Texts: A Core Introduction to Language Analysis, which looks at language aspects essential for the analysis of texts, and a range of satellite texts. These apply aspects of language to a particular topic area in more detail. They complement the core text and can also be used alone, providing the user has the foundation skills provided by the core text. This accessible series, written by an outstanding team of authors, experienced in language teaching, curriculum development, examining and writing, provides ideas and activities arising from experience and practice. Each title has multi-disciplinary appeal but will be particularly useful to A-Level students and teachers and to undergraduates of English Language, Linguistics or English Literature. They will also be of interest to teachers and students of EFL and ESL language courses. The Language of Advertising Angela Goddard, The Language of Fiction Keith Sanger, The Language of Humour Alison Ross, The Language of Newspapers Danuta Reah, The Language of Poetry John McRae, The Language of Sport Adrian Beard.